With a touch of the past represented within its design, the Amish Harvest Trestle Bench brings elements of Colonial American furniture to your home collection. 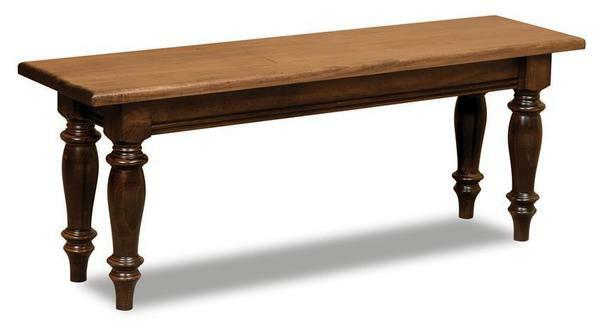 With shapely legs and a smooth bench seat, this solid wood bench will make a grand impression in many areas of your home. Built by the Amish to be durable as well as stylish, this Harvest Trestle Bench can be passed on to future generations to enjoy. A custom made bench adds a decorative accent as well as useful seating in many areas of your home. The Foyer: Create a gorgeous display with a solid wood bench in the foyer and provide a place to sit and change shoes. The Bedroom: Perfect for your master bedroom or guest room, a bench at the foot of the bed creates a relaxing spot. The Hallway: Add something special to your grand hallway with a custom made bench. The Dining Room: Bench seating provides room for family and friends at the dining room table. Photo Op: Use this attractive bench to gather around for your annual family photo. Browse our variety of Dining Benches for more styles and options. Call us with any questions at 1-866-272-6773. Width: 24", 36", 48", 60", 72"